Family dinner on Lunar New Year’s Eve holds a special meaning to Chinese. It signifies the unity of family and kicks off days of celebration. Growing up in Hong Kong, the dinner required extensive scheduling effort between all my extended family members but the occasion held such high priority that I don’t recall anyone missing out even once. Unfortunately, it is also a tradition that I neglected in over a decade despite my very small immediate family. My decision to host the new year’s eve dinner was spontaneous. Last week, I casually mentioned the idea to Dad and Little Brother. To my great surprise, everyone agreed to sit down together for dinner on Sunday. I immediately started planning out my menu. Obviously I could not incorporate all the traditional courses. After all, there would only be three of us. No need to drop by John’s Chinese BBQ for whole chicken. No room in our stomachs for steamed whole fish which symbolizes surplus. Here is my minimalist menu for three. My weekend was jam packed so I had to plan out my cooking carefully. I already wrote much about soy sauce marinated platter and it was meant to be made ahead of time. 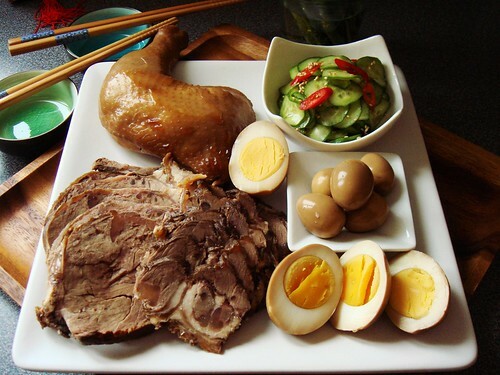 On Saturday, I quickly marinated two pieces of golden coin beef shins 金錢腱, pressed tofu, chicken gizzards, and hard boiled eggs. All that was left to do on Sunday was to slice and plate. 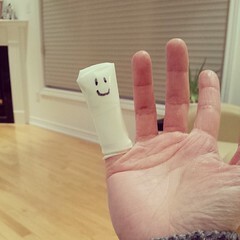 Unfortunately, my pinkie was the casualty in a mandolin accident while I prepared the cucumber salad garnish. Let’s just say I had to take 30 minutes out of my precious prep time for mandatory first aid break. On the bright side, I now have a new finger puppet. 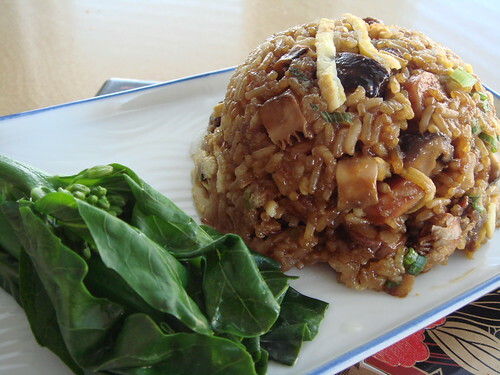 Glutinous Fried Rice is a tried and true recipe I use for years. I soaked the glutinous rice first thing Sunday morning before I went to skating practice. 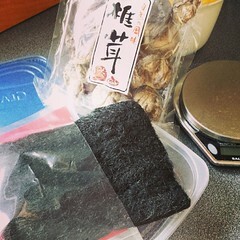 While I was at it, I also soaked some dried black moss 髮菜. To those who are unfamiliar with this ingredient, yes, it looks like hair and that’s why we call it hair in Chinese. If you can get pass its looks, black moss soaks up delicious braising liquid like none other. I think it’s awesome. Oh, and probably highly nutritious and auspicious too. Because every ingredient in traditional new year’s eve meal is auspicious. In this case, black moss symbolizes financial wealth. Who doesn’t want to be rich? As soon as I returned home in the afternoon, I was a woman on mission. 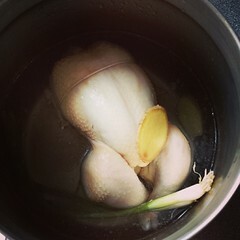 Chicken, ginger, and green onion immediately went into the pot for long hours of simmering to become flavourful chicken broth. I followed the useful direction here to carefully prepare all the dried ingredients. I spent a fortune on dried oysters, dried scallops, dried shiitake mushrooms, and dried shrimps. I was not about to waste even a tiny morsel! Lots of soaking, seasoning, and steaming ensued all afternoon before I braised them all into savoury goodness. When I planned out my menu, I was thankful for a well-stock freezer. I had a box of steamed and chopped assorted cured meat prepared for the fried rice. 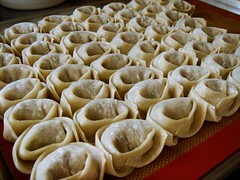 Frozen wonton dumplings that I made earlier were ready to go. As soon as Dad arrived (with dessert! 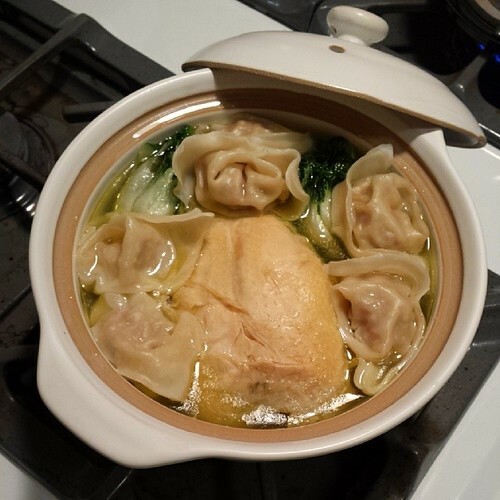 ), I cooked the baby bokchoi and wontons in chicken soup. The clay pot kept the soup steaming hot while I busied myself with the fried rice. Glutinous rice is sticky by nature. After long hours of soaking and brief blanching, it took no time at all to stir fry in the pan. The rice only needed a bit of liquid to finish off cooking before I mixed in copious amount of cured meat, dried shrimp, and shiitake mushroom. 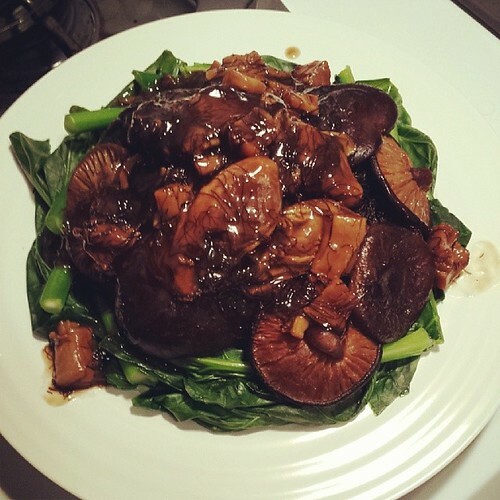 I was ridiculously proud of serving up a traditional Chinese New Year’s Eve dinner, albeit scaled down. Every dish tasted exactly as it should. Most importantly, it was honest home cooked food shared with my immediately family. I do not know if it is a tradition that the three of us will continue beyond this year. However, one thing is for certain. If we’re doing this again, I can do without the mandatory first aid break!